Home » Product Reviews » Revisiting the Clarins Hydra-Essential Intensive Moisture Quenching Bi-Phase Serum – A product I first tried 9 years ago! Revisiting the Clarins Hydra-Essential Intensive Moisture Quenching Bi-Phase Serum – A product I first tried 9 years ago! Back in the day, one of the very first products I tried from Clarins was from their Hydraquench range. Anyone remember using that? That was back in 2009. In 2011, I had little revisit of the Hydraquench range. 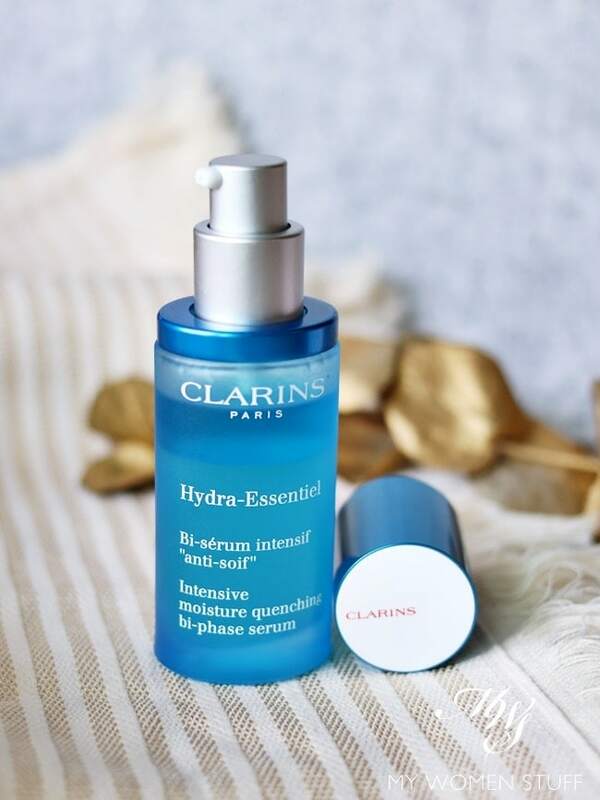 Both times, one of the products that stood out for me was this very same one I’ll tell you about today – the Clarins Hydra-Essentiel Intensive Moisture Quenching Bi-Phase Serum. Thereafter, Clarins and I parted ways, meeting occasionally, but never serendipitiously, to talk about their hydrating range. So, when I found out that it was no longer called Hydraquench, but now called Hydra-Essentiel, and boasting a brand new key ingredient, I was surprised. Then again, Clarins is no stranger to embracing new names and ingredients for their iconic products. The only product I’ve since tried from the Hydra-Essentiel range is this very same bi-phase serum. We have certainly come full circle! 😀 I’ll call it the Clarins Hydra-Essentiel Bi-Phase Serum for short, as it is a mouthful otherwise! As the name implies, and as per its predecessors, the Hydra-Essential Bi-Phase Serum is a two-phase product. An oil that floats on the surface of the light, water based serum. Before using, you must shake it up to mix, whereupon it forms an emulsion. The new ingredient used by Clarins in this new and improved formula, is the extract of the Kalanchoe or Leaf of Life – a resilient succulent from Madagascar. This leaf is able to survive in harsh weather conditions, sudden climate changes and under environmental stress. Harnessing this, Clarins says that this will help your skin remain hydrated, plump and radiant. Lofty promises, Clarins! This is what the product looks like after I’ve shaken it up. It will take on a slightly milky texture, but quickly separates back out once you leave it for a while. When you pump it out, it is a pale blue, just like its predecessors, and less milky than I expected. It is very light, almost like water. Yet, if you look closely, you will see the little oil droplets on the surface. There are a few things I like about this serum. It is very lightweight and absorbs very quickly into the skin. In my case, almost too quickly. I started out using 1 pump of product. It was sucked into my skin like a sponge. I now use 2 pumps. And it still disappears in a flash! I also like that the scent is now lighter than it was before. It carries the same scent from the previous range, the one I remember so well. But previously, it was strong. Far too strong for me. Now, it is a whiff of flowers. Still not a favourite for me, but far more tolerable than before. I must mention the pump here. Previously, it was a spray dispensing system. Now, it’s a pump and I find the product dispenses rather vigorously, so if you aren’t careful, it can splash. And you would want to be careful. I am a little conflicted therefore about this Clarins Hydra-Essentiel Bi-Phase Serum. It is a decent product, but I’ve just outgrown it. 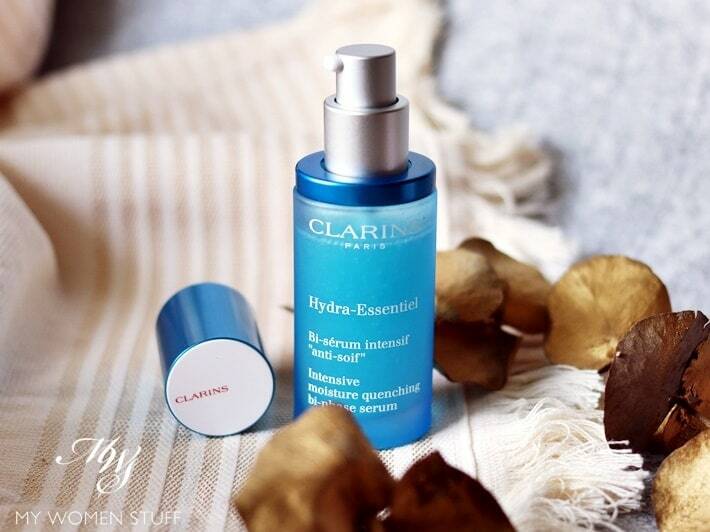 The Clarins Hydra-Essentiel Intensive Moisture Quenching Bi-Phase Serum is a very lightweight, water based serum with a light layer of oil floating in it. Before using, you must shake it up, before dispensing. Use 1-2 pumps in the palm of your hand, and smoothen onto your face. It does seem to delivery an almost instant boost of hydration to my skin, and help it stay hydrated. But, for me, it is a little too light for my tastes. I use it in the day, but I need something heavier in the night. The signature scent is still there, but much lighter than it was before. Good for someone in the market for a lightweight hydrating serum, but not if you have very dry skin. Also, if you have sensitive skin, the fragrance might irritate. 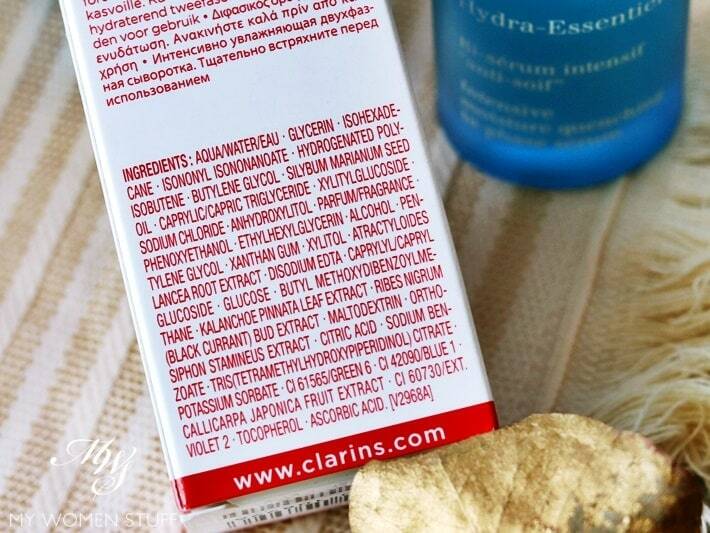 For those interested in what the ingredients are for the Clarins Hydra-Essentiel Bi-Phase Serum here they are. Does this Clarins Hydra-Essentiel Bi-Phase serum tickle your fancy? Did you ever try it when it was called Hydraquench? Disclosure: Featured product was a gift from a media launch. Our commitment is to honesty and fairness. For review guidelines please read my disclaimer. PREVIOUS POST: I’ve put the Bobbi Brown Skin Long-Wear Weightless Foundation through its paces and found it almost perfect! I I would love to have this for sure..my skin also dehydrated and I enjoy the hada labo hydrating essence prior to any day or night moisturiser. Haha so you remember Hydraquench too! 😀 I haven’t used the Hada Labo essence in a while. Must go and take another look at it. Thanks for reminding me. Yep I totally agree! I’m using the gold one which I love to bits! But seriously, for hydration, it outperforms many other more expensive products I’ve used. I am keen in this skincare, the serum is lighweight for daytime. Can I have a try on this product since I am looking for a suitable hydrating product? Do not think I will spend RM248 for a hydrating serum, my wallet is crying.. Thanks for your recommendation. I am currently using their lotion, serum and even the moisturizer (empty bottle) after your recommendation.hopefully you can share more affordable and effective products especially on vItamin c.
Interested! I’m afraid you have to do a quick draw. Thank you. I didn’t receive any notification about your reply to my comment. Maybe my mailbox is broken. THANK YOU! I remember the bi-phase Hydra-Quench serum. The scent was too strong for my liking and the serum was not enough for my dehydrated skin back then (dry on the inside but oily on the outside ). The staffs always told me that my skin was oily and always recommend the oily range, but my skin will be itchy and tight after trying the oily range. Some time later, another brand told me that my skin was actually dehydrated…. * palm on face* I no longer using Clarins for some time now, mainly because of the strong scent in their product. You know, I think we’ve all gone through being mis-diagnosed as oily skin without being told that our skin is also dehydrated. Or maybe people were just not so well educated back then. Like you, while I do like some of their products, their scent is too strong. My complaint in most of these French brands. It’s a pity, because really, I feel it’s unnecessary. But to the French, it’s essential!